March 8 is International Women’s Day, a celebration of women’s achievements and contributions, political and otherwise. It is also an opportunity to consider the lack of women in politics, business, and other positions where these achievements are most often made possible and recognized. The 2012 election ushered in the biggest representation of women in the country’s history. Congress now holds a record 20 female Senators and 77 representatives in the House. New Hampshire elected all women to its delegation for the first time. Women also broke other barriers last year. Tammy Baldwin became the first openly gay member of the Senate and Mazie Hirono is the first Asian-American female Senator. Still, the country’s political makeup is a far cry from a proportionate representation of the sexes. 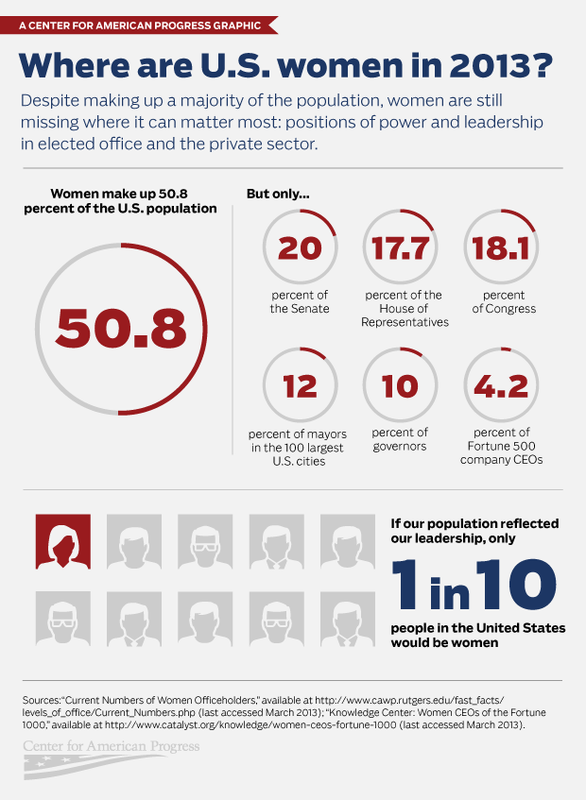 The Center for American Progress compiled concise, but telling numbers of how few women there are in roles of leadership. The ratio of women to men in Congress barely reaches 1 in 5, and that figure shrinks when looking at state and local administrations. U.S. Congress is made up of 18.1% women. Of the mayors of America’s 100 biggest cities, 12 are women. 5 of the country’s governors are women. 4.2% of Fortune 500 company CEOs are women.